58) What is Direct imaging and Direct printing? Direct imaging is a new technology that directly transfers the digital image to press plates like Letterpress, Offset, and Intaglio printing using laser beams. 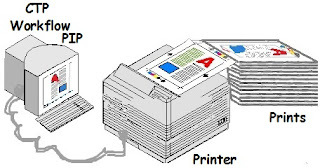 Direct printing which is technically called Digital printing is a process in which the image is created on the computer and transmitted directly to the output device i.e the printer to print on the paper. 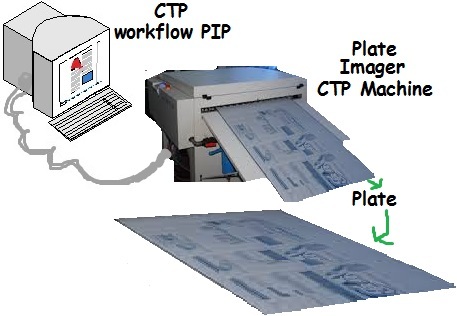 This process known Copy to Plate or CTP is a new technology by which the printing plates needed for the printing machines are prepared directly using laser beams. The advantage is improved resolutions of the images and print quality as well. Since the laser records the images onto the plate exactly as per the digital files stored on a computer, the print quality will be excellent. Moreover the manual steps of conventional prepress work such as producing films, preparing the films for plate making, making plates, and mounting and registering plates on the press etc are all eliminated. There are equipments available which can be attached with the offset presses to store the spool of special plates meant for direct imaging. As soon as the new plate is made ready by direct imaging process, such plates are automatically fed onto the plate cylinder from the spool. This reduces the make ready time drastically. 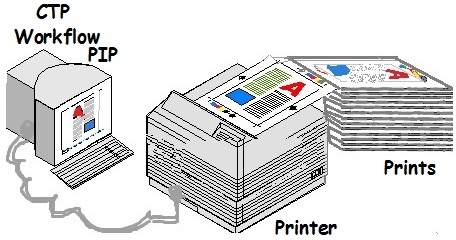 This is a process in which the image is created on the computer and transmitted directly to the output device i.e the printer to directly print on the substance. No pre press operation including making of negatives from thee composed matter , assembling etc, or plates are required. The prints are taken combining both text matter and the photographs including the colored ones, using Liquid ink-jet, wet/dry toner systems, solid ink-jet, thermal-transfer etc. The equipments also aid in saving space, cut down production time and most suitable for small and immediate jobs. Determining when to use digital printing instead of a traditional printing process is highly dependent on the number of prints needed as well as the production speed of the output device. One important advantage of Digital printing is the possibility of printing variable Data using information obtained from the database or external file. The texts and graphics can be changed on each sheet without stopping or slowing down the press. For example, personalized letters can be printed with a different name and address on each letter. Digital printing is also a very flexible process that provides a great opportunity for creativity as it allows the press to make the desired changes without prepress operations. By digital printing even very small quantities can be printed in the shortest time. The digital printing machine normally uses only four colour cartridges with whose combination the multi colour printing is carried out. 61) What is Bar Code Printing? A bar code is an optical machine readable representation of data relating to the object to which it is attached. 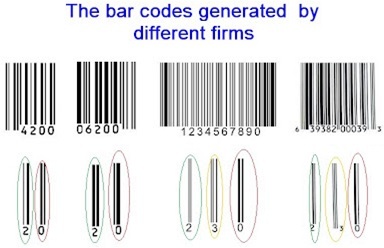 Bar codes are made up of a series of narrow and wide bars that can be scanned using a photo-type of sensor. Each firm can generate their own coded bars with bar code generator. The pattern of each bars in the code represents a character. This sensor reads the bar code, turns it into a signal which is then sent to a computer or network. All bar codes commence with a unique start character and concludes with a unique stop character. This scanning method calculates the measurements between each bar and space and translates those measurements into characters for authentication. 62) Which of the important factors influence higher percentage of rejection during printing and how to control them? Defective paper lots causes higher rejection due to reasons like fluff ( White spots on the printed areas ), creasing of paper, mis register due to expansion and shrinkage of the paper while carrying out printing. Paper expansion and shrinkage are due to atmospheric changes. Such cases are to be seriously taken up for corrective action with the suppliers. Subjecting the paper to proper storage condition till the printing is completed is another corrective action. (b) Blank sheets getting torn during feeding or printing, malfunction of the machines etc. Careful handling of the sheets and proper adjustment of machine settings during machine run will reduce its tally. Periodical maintenance of the machines keep the machines in fit condition. Proper oiling and greasing of the machine by the machine crew will also help. Strict supervision on procedures to be followed is needed. (c) Printed sheets showing colour variation, mis register, wrong prints, white spots etc. Proper ink flow settings, machine adjustments, careful and frequent checking of the printed sheets taken out from the delivery pile, random checking by the supervisors besides regular checking by the workers during various printing stages and taking immediate corrective action will reduce the wastage. Where the press can afford deployment of online inspection equipments like sheet inspection gadgets which display the error spots on check screen instantly as the sheets are delivered will also help in detecting the exact places of errors instantly to take corrective action. Strict supervision on the work needed. The wrong prints are generally noticed in numbering process if the printed sheets carry numbering. 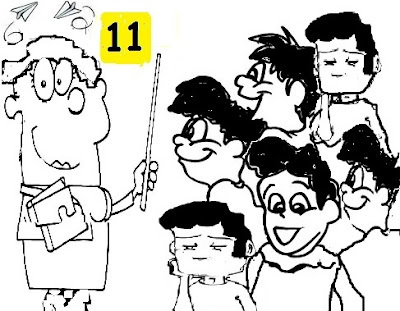 Therefore careful and frequent checking of the printed sheets for wrong numbering and taking immediate corrective action will reduce the rejection percentage.